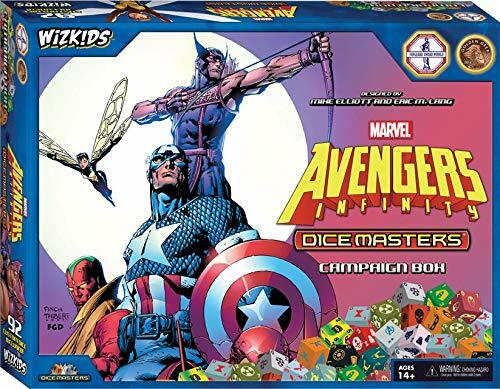 Avengers Infinity Dice Masters Campaign Box Review — GamingWithSwag.com - Dads By Day, Gamers By Night. Wizkids and their dice battling game Dicemasters has left gravity feeds and booster packs behind and are sticking to campaign boxes and team packs going forward. Here we have an Avengers box featuring most of the popular avengers featured in Infinity War, and if you get the two Marvel team packs (Justice Like Lightning and Kree Invasion) it will fill in a few gaps with more Guardians of the Galaxy and others like Hawkeye and Ant-Man. I will take a look at the characters within below if you want to start discussing strategy but first lets get into value. The decision to get rid of rarity means you can stop hunting down Super Rare dice and getting into eBay battles but it does lose the thrill of opening mystery packs. I like the budget friendly element of knowing the cost in advance, but there are still ways to spend extra money. The most obvious being that the campaign box has 3 dice for each character however you can use up to 4 for most characters so if you want extra dice you have to buy another box with a ton of waste, or get extras on eBay or a singles site. Typically, only low cost characters really benefit from the extra dice, so if you go all in you may only want to buy the 2-4 cost characters which might not be too bad. Other than this dice volume concern my only other gripe is that the set is light on villains so if you are entering the game you will need to work to get more villains if you want some pure good vs. evil action. With that said lets get to the cards. Black Panther hates villains, and is good against them. If your opponent doesn't have villains he isn't great. If the meta gets villain heavy though he can be a decent counter. Black Widow continues to be one of the best low cost characters with a global that can disrupt your opponent's plans but the Crimson Shadow being able to deal direct damage to them can be amazing at pinging away their health. Armin Zola seems best in teams where you want active characters and probably specifically villains to stay in your field for ongoing effects. The Avengers ID card is like an extra action die to buff your Avengers centric team but has no value without going hard on Avengers. Captain America continues to be a great pair with sidekicks which gives him decent utility on any team but ideally would be with others that manipulate sidekicks. Doctor Strange is consistently designed to work best with action dice and is hella hard to kill. Dormammu seems like a meta counter to teams that flood the field with characters or abuse global abilities, otherwise I hate him. Gamora is a great utility character but her Power Gem card is clearly the best. Hulk is usually a powerhouse but I don't really love these versions over previous options although the "Explosive Beginnings" card making him much more affordable at 5 is interesting while the other two are more powerful although I love my Hulks with the Overcrush keyword. Iron Man is primarily designed to counter globals and action dice which are popular, or you can go with Anthony Stark and some potential healing. Loki is always a nuisance to play against and here I think the "Chains of Destiny" card is the most consistently frustrating, although "Father of Mayhem" can pull off some power plays. Red Skull is not very exciting although "Dust of Death" either heals or deals direct opponent damage is always strong. The Guardians have historically had strong team synergy and you get a little of that here as well as another Action die pinging nuisance card. Thor in this set is all over the place with three completely different build types which might make him one of the most valuable. Vision is heavy on defense and his offense is weak unless you are up against Fist and Lightning types and rock the "Synthetic Human" card. Wasp is great and will be a must add for some "Attune" decks as she allows you to flood the field with it, or she can counter it dealing direct damage or just be a solid two cost with the only downside being all her dice have a cost which isn't typical of 2 cost characters. I remember when Action dice use to be sorta cute, now they are crazy useful and it is hard not to build around them with attune decks. This set is primarily big powers with only one 2 cost, and several could lead to blow out plays like "Blam Blam Blam" or "Crowd Fighting" or nullifying a singular energy type with "I Want You". If you are new to the game or have not purchased previous collector boxes I want to highlight its functionality as a storage device. Below is the whole set crammed together and you can see half the storage is still available on this level and there is another plastic sleeve that goes on top doubling the rows of dice storage. The box doesn't easily slide open and they stack on top of one another nicely to quietly and safely transport your precious dice. I use Zen Bins for many of my dice still but I fill these boxes first because they are excellent. This set is another decent collection of Marvel's biggest heroes and some villains with cards that would fit into a few different archetypes and decent teams could be made only using these cards if you wanted to sample the game. The box offers great storage and the action dice has some powerful options so people wanting to maximize the "Attune" skill this is a great set. Be sure to keep an eye out for more Dicemasters articles as we got on our hands on the team packs as well as the upcoming Warhammer releases.